Pick your power in the all-new 2019 Nissan Frontier! With your choice of an available 4.0-Litre V6 Engine – packing 261-Horsepower, or an available 2.5-Litre 4-Cylinder Engine – packing 152-Horsepower! The V6 Engine comes available with either a 6-Speed Manual or a 5-Speed Automatic Transmission, while the 4-Cylinder Engine comes with a standard 5-Speed Automatic Transmission! The 2019 Nissan Frontier also comes available in 5 trim levels: S, SV, Pro-4X, SL, and the Midnight Edition! The SV and Pro-4X are offered with your choice of either a King Cab or a Crew Cab, while the S comes in King Cab only, and the Midnight Edition and SL trims come with Crew Cab. Plus, for added protection – all trim levels come available with a factory applied Spray-On Bed-Liner! On the exterior, the Frontier’s frame is built with high strength steel – offering rock solid durability. Add in a standard Chrome Front Grille and Rear Bumper, and the exterior is also stylish! Plus, the Tailgate-Mounted Spoiler helps reduce drag, while the Rear Privacy Glass adds attitude. On the inside, you’ll find a smartly designed interior space, offering seating for five. Forward Hinged Doors also make for easy entry, while the available 60/40 Spilt Rear Bench easy folds down to create even more space! You can also flip up the rear seat for even more room! Nissan also takes things up a notch by including a standard 7-Inch Touchscreen Display, including an AM/FM Audio System with 4-Speakers! Also available is the Rockford Fosgate Audio System with 10-Speakers, and NissanConnect Mobile Apps, including Navigation! 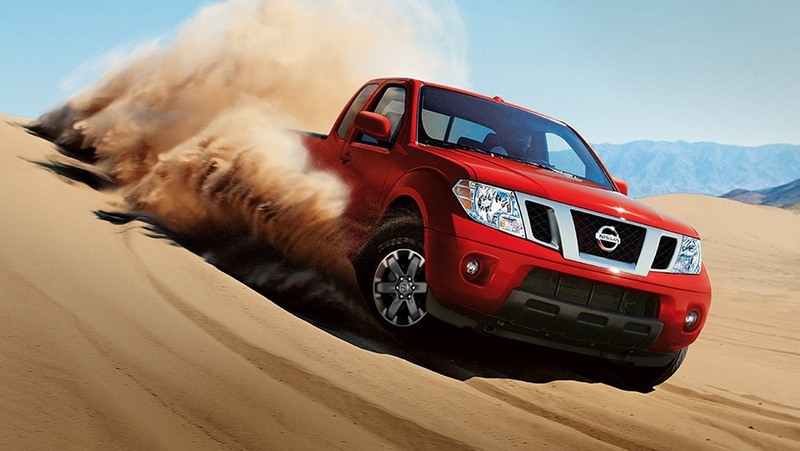 The 2019 Nissan Frontier also comes well equipped with standard Advanced Driver Assist Technologies including Vehicle Dynamic Control with Traction Control, a LATCH System, a Tire Pressure Monitoring System, a RearView Monitor, and a Rear Sonar System! If you like would like to step into a 2019 Nissan Frontier, please drop by and see us here at Guelph Nissan, or take a look at our 2019 Nissan Frontier Online Inventory!